There seems to be a belief that tattoo studio etiquette differs from the commonly accepted set of guidelines by which most people conduct themselves. It doesn’t. You should conduct yourself with the sense of decorum that you do when you are in any other business, and is no different that patronizing a nice restaurant: You are the customer (although we prefer the term “client”) and we are going to make your experience the best one we possibly can. On the other hand, we have the right to expect you to conduct yourself in a civil, polite, and respectful manner in return. 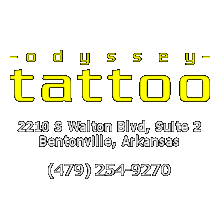 Your goal and our goal is the same: To get you the perfect tattoo in the most pleasant way possible. With a little etiquette, from everyone, it is not hard to do. Turn your cellphone to silent. Do you really want your artist to be startled when your phone goes off? If it goes off in the middle of the tattoo and distracts the artist, that mess up is on you. Tattoo studios are not really a place for children. There are many hazards for children to be exposed to; it is an adult environment; and they can be very distracting to you, your artist and other clients. While we allow children in our studio, your artist will really appreciate it if you can find a sitter for the kids so that you can come to the studio without them. Please do not bring a “cheering section” to the studio. Very few artists want a bunch of your friends crowding the work area while he/she is trying to mark you for life. Please maintain personal hygiene and physical decorum. Unfortunately, this has to be said for some people’s sake. There is nothing more unpleasant than having to work on someone who… smells. Don’t make us send you home to bathe. Do not come in if you have been drinking or if you are under the influence of something. Show your tattoo artist some respect and come sober. Nobody likes dealing with drunks. If your breath smells of alcohol you are not going to get a tattoo. If you are wasted, you won’t make a good decision on what to get and you will bleed so heavily your tattoo is likely to look like it is done in pastel colors. Do not ask your artist to draw something just to see if he/she can. There are people who go to studios and ask for one thing to be drawn after another without ever getting anything. Don’t be that guy! If you want something drawn, an artist will be happy to work on one with you. We will change or re-draw it until it’s just the way you want it; but make sure you’re ready to get it when the drawing comes out right. We charge a $40 drawing fee that comes out of the final price of your tattoo. Or goes to the artist if you don’t get the tattoo. Do not brag to a tattoo artist about how cheap you got your other tattoos. You will not earn any “brownie points” and it SURE won’t get you a better deal on a tattoo from the artist you’re bragging to. If you are quoted a price, that IS the price. Bragging about paying $20 for a tattoo is likely to elicit a critique of your tattoo that is less than flattering. If you want a professional tattoo or piercing, be prepared to pay a professional price. Do not try to bargain with your tattoo artist like you are some vendor in a foreign market. You would not go to the grocery store or a restaurant and try to talk a clerk or a waiter into lowering the price. Bargaining in a tattoo shop is an exercise in bad taste; and the quickest way to make your artist mad. The last thing you want is your tattoo artist being upset at you. If all you have is a certain amount, ask the artist up front if he/she can work with that budget. If they cannot, then wait and save up until you have the full amount. If you can’t afford the tattoo you want, talk to your artist and see if there’s a way to work out a payment plan (multi-session/pay-as-you-go) or wait and save up. If you settle for something else, or even a smaller version than you really want, you’ll more than likely end up regretting it. People who “price shop” for tattoos end up with inferior tattoos. Don’t let that happen to you. It will cost you more in the long run. Trust us. Do try to have some kind of idea what you are looking for before you come to the studio. Impulse buying is not a good way to find a tattoo that you will be able to live with for the rest of your life. Of course, we understand that you may be coming in just to get some ideas; but you should have some kind of idea that led you to the decision to get tattooed in the first place. The more clearly you can describe what you want, the quicker and easier we will be able to create the design for you. This may all seem to be common sense but the reality is that artists deal with breaches of this etiquette all day, every day. A little common courtesy and etiquette can go a long way towards making your entire tattoo experience much more rewarding and pleasant.